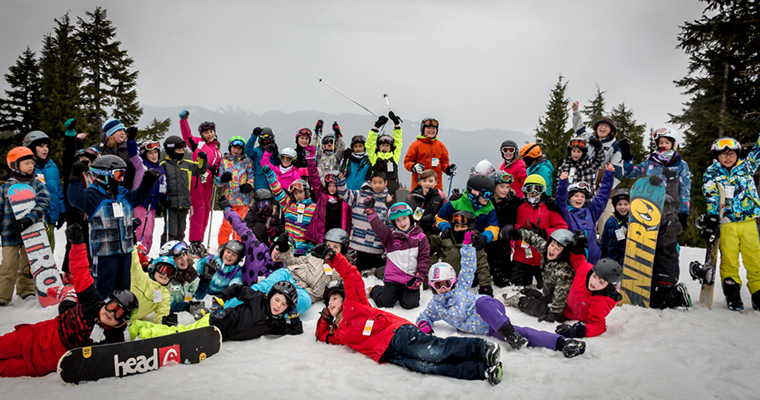 Students in Grades 4-8 receive a FREE SEASON PASS when their school books a four-day Ski & Snowboard Lesson Program. Organizing Teacher or PAC Member receives a FREE SEASON PASS when booking a half-day Ski & Snowboard Lesson Program or a full-day Snowshoe + Tube or Toboggan Program. For over 40 years Mt Seymour has guided students to success in the positive, encouraging and safe environment created by our certified instructors and experienced guides. We are dedicated to building a culture of outdoor recreation by engaging children with their natural environment. Mt Seymour is the ideal classroom - clean mountain air, healthy activities, professional instruction and lasting life skills. At Mt Seymour we know the challenges and energy it takes to organize a group of students. Our team is ready to assist you with every step of the process. We can send you all the information needed to organize your class, excite your students and assure their parents. Bring your class for an Outdoor Education Field Trip on the trails of Mt Seymour this fall! Learn safe trip preparation and planning, how to build emergency shelters, water collection and edible plants identification, fundamentals of navigation and rescue signalling, backcountry food storage, team survival scenarios, fun educational games and more. All grades welcome. $29 per student. Runs 9:30am-2:30pm. To check availability please contact Chris Gwilt at 604-986-2261 x215 or cgwilt@mtseymour.ca. We now have a bus for rental between schools and the mountain! Choose either full-day, four-hour or two-hour lessons in the expert care of our certified instructors. All lesson prices include a full-day lift tickets and rentals. Our safe, modern equipment and efficient rental system means you and your students will be geared up and out on the slopes in no time — often in 30 minutes or less! Rentals and lift passes are valid all day long. Helmets are included in the rental costs and will be provided to all students. 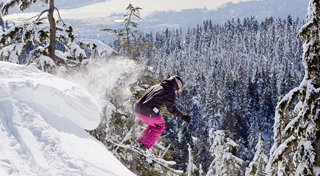 Mt Seymour hosts some of the best teaching terrain around. The gentle slope and covered Magic Carpet lift make our beginner area safe and accessible. Opened in 2012/13, the Mystery Express Quad Chair makes getting to our intermediate terrain faster and easier than ever. We offer guided-mileage programs for the experienced skiers and snowboarders in your class. Four lessons (once per week) is ideal and achieves the goal of teaching students how to get around the mountain independently, and how to ride the chair lifts safely. The rates below are a package price and include lesson, lift ticket and rentals. Mt Seymour’s model is a “one price for everyone” to make fee collection easier for schools, and has the added benefit of “no need to bring equipment with you”. Students pay the package price regardless if they want to use their own equipment or have their own pass. If the student is a skier, you can always suggest they rent a snowboard from us and learn a new sport! **Full-day program includes supervision of students from arrival to departure, four hours of lessons, and hot lunch. For every eight paid students, schools receive one free chaperone on the day of lessons. Additional chaperones receive 50% off public lift ticket and rental rates. Spend the morning learning to ski and snowboard, break for lunch, and stay as long as you want playing in the snow, including tobogganing, making forts, and building snowmen! The snowplay area is dependent on weather and snow conditions. Designed to keep everyone happy, students will have the chance to try all of our winter school activities. Flexible dates and options available. Our staff is available to come to your school and give a brief presentation on how our lesson programs work. Also, do you need to apply for winter field trip approval from your District? If so, please ask us for a copy of our FAQ with answers to questions about safety, supervisor to student ratios, learning expectations, and more. With a school booking, we are pleased to offer free parking for winterized busses and cars equipped with winter tires. Mt Seymour has purchased a school bus to transport school groups to and from the mountain. Call us for rates and availability, and don't worry about cancellation fees, we don't have any! To book a Lesson Program please contact Chris, our School Accounts Manager, at 604.986.2261 x215 cgwilt@mtseymour.ca. Schools receive one free chaperone for every 10 students. Primary classes receive one free chaperone for every 5 students. Meet us at Enquist Lodge and enjoy quicker access to easier trails for your youngest students. Stay afterwards in our Snowplay Area especially designed for primary students – build a fort and a snowman, or just play in the snow before heading back to school. The winter discovery snowshoe program is designed to introduce students to a winter environment. This is achieved by incorporating a major educational portion to the discovery tour, where students learn about what is needed to go on a winter hike, and also some extra information on the environment they are surrounded by. The program is broken up by games to ensure that we keep the energy high and that kids have fun. Overall we want the kids to have a positive experience, this might mean that the ratio of information to games might be shifted depending on the group. Have fun playing games and learning to snowshoe while experiencing the winter ecosystem. Just as younger animals play games to practice skills they’ll need to survive in the mountain environment, we too can learn mountain life skills through play. A fun and interactive way to learn about the history of Mt Seymour and its surroundings. Learning through gameshow-style activities in the snow! This interactive teambuilding program leads groups through fun, fast–paced, team oriented tasks and challenges. Participants will engage in friendly competition against each other while building team spirit, burning energy and having tons of fun. A big game of capture the flag in the forest is a usual favorite! 3 hour program: Learn the basics of winter safety and test your ability to survive in the snow! Teams will be given survival scenario to work through using only the equipment found in the backpack provided. Students will learn about trip planning and preparedness, including AdventureSmart’s Essentials of Backcountry Safety. 2 hour program: Learn the basics of staying safe outdoors in the winter. Children will play their way to learning about how to be prepared, how to avoid getting lost, and what to do if lost. A mini survival challenge will be used to let the children share what they've learned, all the while having fun and gaining confidence in our snowy winter forest. Overviews of each program available upon request. This program introduces students to the concept of sustainability and engages in a variety of activities that will relate natural principles of sustainability to every day concepts. By the end of the program, students should have a better appreciation for how much we can learn from nature and how that translates into our lives. The main difference between the elementary and high school programs is the depth of information addition of more technical language. Think Ski Patrol...... but on snowshoes. This program encourages team development and effective communication while tasked with basic but practical first aid challenges. Your class will also cover the basics of avalanche safety. Join our Ski Patrol team for an engaging 3 hour program crammed with first aid scenarios, games, useful skills and safety information. Your group will have a newfound appreciation for the work that goes into keeping you safe on the mountain. With a school booking we are pleased to offer free parking for winterized busses and cars equipped with winter tires. Mt Seymour has purchased a school bus to transport groups from school to the mountain and back again. Call us for rates and availability, and there's no need to worry about cancellation fees, we don't have any! To make a Snowshoe Program booking, please contact our Schools Registrar at 604.986.2261 x214 schools@mtseymour.ca. Everyone loves Tubing and Tobogganing! Our tubing area is equipped with a handle tow and we provide durable, nylon covered tubes for a smooth, controlled ride. All ages - must be 48 inches (122 cm) to tube. Sliding carpet rental for only $1. Students are encouraged to bring their own toboggans. Snowplay Area for primary (K-3) students to make snow castles & build forts. Complimentary when combined with another activity. Dependent on weather and snow conditions. For school bookings we are pleased to offer free parking for winterized busses and cars equipped with winter tires. Mt Seymour has purchased a school bus to transport school groups to and from the mountain. Call us for rates and availability, and don't worry about cancellation fees, we don't have any! To make a Tubing or Tobogganing booking, please contact our Schools Registrar at 604.986.2261x214 schools@mtseymour.ca. Ask us about our hearty and affordable lunch options. We will gladly send you our school lunch menu. Reserved seating available with group lunch booking. Classroom space is available to maximize your students' learning experience with a day of outside and inside learning. One hour in our classrooms is free based on availability. Contact us to learn more. Grade 12's and their teachers are invited to book our Snow Bus for a day of skiing and snowboarding! Package includes a burger & beverage, transportation to and from your school, lift ticket and rentals. Minimum 32 guests. Evening (6-10pm) $69 per student, afternoon (2-10pm) $79 per student, and all-day (10am-10pm) $99 per student. Contact Marie Kellett at 604-986-2261 x208 or mkellett@mtseymour.ca. For ages 7-14, these week-night camps run Mondays, Wednesday, or Fridays from 4:00-8:00pm for 4 weeks. These camps give kids a chance to safely explore the mountain in a fun, social environment, while learning to ski or snowboard. For all abilities. Includes shuttle service from Parkgate Community Centre and dinner on the hill. Inquire at camps@mtseymour.ca. To find out how we can create a unique experience for your class please contact Chris, our School Accounts Manager, at 604.986.2261 x215 cgwilt@mtseymour.ca or to make a booking, please contact our Schools Registrar at 604.986.2261 x214 schools@mtseymour.ca. Just want to say thank you for making our day at Mt Seymour a big success. I heard so many positive feedback comments from the staff and students at Fraser River Middle school regarding the instructors and rental shop staff members. The patience, helpfulness and positive encouragement from everyone was amazing. I love how everyone at Mt Seymour works collectively to make the students and adults experience feel memorable. We had a lot of students today first time skiing or snowboarding. Judging from the positive feedback and response, it won't be the last time they come back to Mt Seymour. Please pass on a big thank you to the instructors and rental staff members. They were amazing and stood out in so many positive ways. Thank you so much for a FANTASTIC day at Mt Seymour Chris and Gail and your whole army of staff!!! I would describe the day as flawless! We as a staff really appreciated how highly organized and helpful the staff was in getting the ski tags on coats, into the rental hut and outfitting the kids with equipment, to organizing them into groups and getting them out on the hills! We have received excellent feedback from our students. For the vast majority of our students, this was their first experience at Mt Seymour. I have heard that many students are planning on coming up to Mt Seymour with their parents . I was hoping to secure a date for next school year as soon as possible so we can do this again next school year. The trip was perfect Gail. Thank you so much for being so accommodating. I will highly recommend you to my fellow PE teachers in other schools. From the instructors to the organization, it went really well. Also the weather helped a lot! Hopefully we will get to do a longer trip next year. I just want to send a shout out to Chris and the Ski Instructors at Mt Seymour. Our School took part in a 4-session ski/board lesson program as part of a school field trip and were more than pleased with their dedication to teaching the kids to ride/ski and the organization of their program. This was our first year and we looked at all the Mountains in the lower mainland. We chose Mt Seymour due to the size of the mountain and the amazing program they offer. Chris has always been available to answer my questions and take care of anything we needed. I highly recommend Mt Seymour as your first choice for your ski/board school trip. Thank you to the Staff at Mt Seymour for assisting in making our school ski trip so memorable. Everyone (parents and teachers included) had an amazing time and the guides worked well with the students and adults. We will be looking forward to booking next year. The combination of tobogganing and snowshoeing was great. It gave the students a chance to enjoy an activity they would not normally get (snowshoeing) with a more dynamic/exciting activity (togogganing). Thanks again for being an incredible host for our field trip. By all accounts from chatting with kids on the bus home and at school today, students enjoyed themselves on the mountain, despite the soggy conditions. As always, your staff was awesome! I had the opportunity to be in a snowshoeing group with Ben (one of your instructors). He was amazing! Seriously outstanding. Great rapport with the kids, encouraging and very knowledgeable. We had a great time and our snowshoe guide was very patient with a high-energy group of boys. I also want to let you know that one of your male staff members, went out of their way to drive my student with cerebral palsy from the main hut to the tube park. Then at the tube park other staffers accommodated his disabilities by helping him to the cable and allowing him to the front. You and your staff are doing an amazing job of working with the schools and with disabled students. The kids all had fun last Wednesday. I think they have all found a new passion. Thank you to your wonderful instructors who were so patient with them. I loved that the kids got to work with actual tools like the tarp, rope, and shovels. They really enjoyed the little 'snow melting' setup they had to build too. It was a really nice, neat package that each guide had with them for their group. We loved the field trip and the students all mentioned it as their favourite Grade 7 memory in the yearbook. Thank you so much for making our trips to Mt Seymour such a stress-free, streamlined, positive experience. I just really appreciated working with you through the weeks and months prior to our event. Thank you, too, to the amazing, professional staff who made the lessons fantastic for the kids. They will remember these days for the rest of their lives. I look forward to next year! Thank you! I just wanted to say a huge 'Thank-you' to you and your staff for being so helpful and patient with our students. Your special needs teachers were awesome! I've noticed a big improvement in your overall customer service/relations, and we were all very pleased with this year's Mt Seymour experience. Keep it up! Thanks so much! You and your team made the experience life-memorable! I so appreciate your attention to detail and your flexibility. Looking forward to another great program next year! Your level of organization with groups is so beautifully streamlined and efficient, and each and every staff member who assisted us (working through paperwork details, meeting the bus, Rentals, Ski Patrol, instructors, lift attendants, cafeteria) was warm, knowledgeable and went out of their way to help. Our staff and parents were very impressed, but of course it is the students' voices that speak loudest. At Mt Seymour, we understand that the BC Schools Curriculum is evolving and changing, especially to include more experiential education and place-based learning. We’d love to help your classes make this transition! Below we have detailed some important linkages, both broad and specific, between our outdoor education programs and the proposed new curriculum. We focus on learning by doing and aim to help students experience the mountain environment using all of their senses, thereby laying a foundation for further growth and inquiry. It is our goal to spark an interest in your students that will assist them to express and reflect on a variety of experiences, perspectives and worldviews through place, with that place being Mt Seymour, the sub-alpine and British Columbia as a whole. Many of our programs will get students thinking about the world around them and discovering out of the box links between nature and humans. Seymour History Gameshow uses the art of questioning to help students solve mysteries concerning Mt Seymour`s natural and cultural history. Our Snowshoe Showdown program will get your students active and having fun! These programs aim to cultivate an enjoyment of outdoor recreation in the winter environment and teach students how they can stay active and healthy both on and off the mountain. Additionally, our Winter Survival Challenge programming will have students think about being responsible for themselves when enjoying the great outdoors and make them aware of steps to stay safe whether they are enjoying nature in the winter, summer or anything in between. We are lucky enough to have our programs take place in a BC Provincial Park, and we take our responsibility to pass that information on very seriously! Your students will learn about our place in the mountain ecosystem and how they can help to protect it. This theme is recurrent in many of our programs, however Nature Games and Sustainability on Snow are particularly relevant. We feel that these programs will also help your students gain an understanding of contributing to community and caring for the environment. We recognize that sometimes students need a gentle nudge to work together and learn more about each other. We have various activities, such as shelter building and solving complex challenges that will get your students excited about teamwork! Our Autumn Outdoor Program will have students showcase the skills they have learned throughout the day in a team setting, while The Snowshoe Snowdown has plenty of games, challenges and puzzles to keep your students entertained and working collaboratively. Finally, students will experience and interpret the local environment through the help of our highly qualified guides! Our guides can help students to spot patterns and relationships in the mountain ecosystem, which may then be applied to their thought process back in the classroom. The Winter Discovery tour is a great introduction to get your students engaged and thinking about what they see, feel, smell, taste, hear and experience on the mountain. Science K-9: Many of our programs discuss life cycles and features of living organisms as well as the interactions of plants and animals with their environment. Our curricula are particularly aligned with biology and earth science learning outcomes and can be made to suit any grade level. For younger groups we would suggest Winter Discovery or Nature Games to get students thinking about the plants and animals of Mount Seymour, how they interact and survive in the mountain ecosystem. Social Studies K-9: All of our programs focus on the place-based education that is stressed in the evolving social studies curriculum, however Seymour History Gameshow would be particularly helpful to classes interested in learning about what life was like on the mountain before roads and ski lifts, how people have interacted with the area over the years, and about local First Nations cultures. Environmental Science and Human Geography 11-12: Sustainability on Snow is a great first step to get students thinking about how human activities change landscapes in a variety of ways. The program also aims to achieve the learning outcome that “healthy systems are resilient, interconnected and adapted ” by using nature`s own examples of sustainability. Students will also learn how humans have modelled many of our own technologies after the earth through processes of biomimicry. For students considering careers in the earth or environmental sciences field, Navigate Nature is a great introduction to maps and bearings. Physical Health Education K-12: All of our programs will have students out and about, experiencing the mountain on snowshoes or their own two feet. We make sure that educational stops are broken up with exploration and games to keep your class moving. Specifically, our Snowshoe Showdown program will help students “explore methods of monitoring and adjusting exertion levels in physical activity“ as well as gain an appreciation of outdoor recreation. Nature Games, Snowshoe Showdown and Winter Survivor Challenge will help younger students to “develop and demonstrate safety, fair play and leadership in physical activities“. We are in the business of teaching students to get excited about being outside and exploring the natural world, which is beneficial to the physical, emotional and mental health of all children. Physical Geography and Earth Science 11-12: Seymour History Gameshow delves into basic plate tectonics as well as how natural processes have shaped the landscape and contributed to human uses of it. Free Teacher Season Pass - Bring your class to Mt Seymour for a full-day of activities and receive a complimentary Adult Season Pass! A full day can be ski and snowboard lessons (2 hour lesson + free time ski), snowshoeing plus tubing, and snowshoeing plus tobogganing. Teachers' Lounge - Mt Seymour has converted the Hut into a Teachers' Lounge. Enjoy this quiet and warm space while taking advantage of our free Wi-Fi. Spend your professional development day on Mt Seymour learning about our school programs and enjoying time outdoors. Take a two-hour snowshoe program or let us guide you around the mountain on ski/snowboard, then enjoy time on your own, or take a slide in the tube park or down the toboggan hill before heading home. Activities are free of charge. Limited availability. Pre-register at cgwilt@mtseymour.ca or 604.986.2261 x215. Mt Seymour requires volunteers to assist our professional instructors with our lesson programs for skiers and snowboarders ages 4-6. Our programs operate throughout the day on weekends, during the Christmas and Spring Break periods, and evenings on Mondays, Wednesdays and Fridays from January to March. In return volunteers receive a full Staff Season Pass, training and staff benefits. Minimium 15 years old (14 with letter from parent/guardian). Do you have an active ski/snowboarding community? For 2018/19 PACs earn 10% cash back from Season Pass Sales. Must sell a minimum of 20 passes and Group Organizer can earn a complimentary Season Pass! Added bonus for families,our 2018/19 season passes include 2 free days at Apex Mountain, Manning Park and Mount Washington. Mt Seymour Season Passes have no blackout periods or restrictions. Sell passes by October 14 for best rates. Contact Marie Kellett at 604.986.2261 x208 or mkellett@mtseymour.ca. Full-day lesson program — 4 hours of ski/snowboard lessons, including lift and rentals. To learn more about this program, including eligibility criteria, or to receive an application form please contact Chris at cgwilt@mtseymour.ca.